Olivier Giroud scored in either half as Arsenal edged past Southampton to move four points clear at the top of the Premier League. 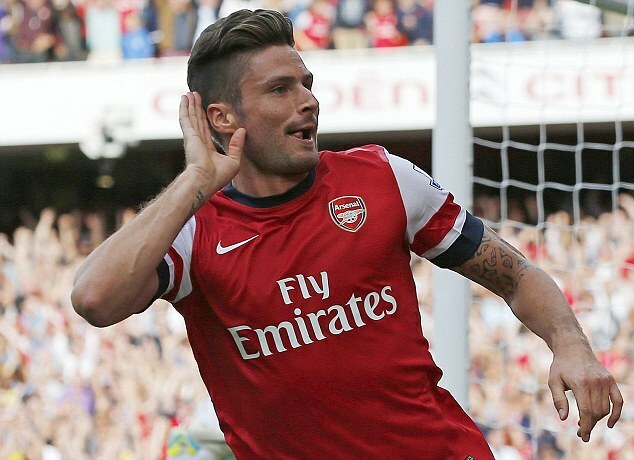 Saints goalkeeper Artur Boruc gifted Arsenal the opening goal, dwelling on a back-pass and allowing Giroud to tap in. “We really wanted to play the game from the start and really respected this team. We were a bit lucky on the first goal, but I think that really helped us for the rest of the game,” Frenchman, Giroud, said after the game. Jack Wilshere and Aaron Ramsey had hit the post, while Adam Lallana and Jay Rodriguez went close for the visitors. Giroud sealed victory for the ‘Gunners’ from the penalty spot after Jose Fonte was penalised for pulling Per Mertesacker’s shirt. Arsenal forward Theo Walcott returned for Arsene Wenger’s side, coming on for Santi Carzola in the second-half, after spending two months on the sideline while recovering from an abdominal injury. Falconets Now Set to Play Sierra Leone in a 2014 World Cup Qualifier. Sharapova, Wozniacki and Ivanovic Lose Out of Wimbledon in Straight Sets. Manchester Derby: Moyes, Pellegrini, Admits Super Sunday’s Clash’s Crucial. Photos: Premier League Club’s Kits For 2013/14 Season (Look Before Ordering). Next articleI Won’t Be Shocked to Lose My Job Before the World Cup Again- Keshi.